TOFU MOM . . . and gravy! 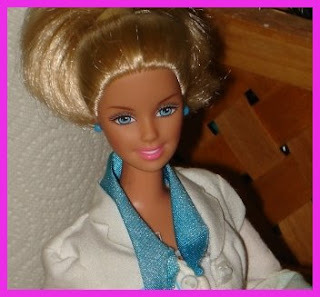 : Barbie's Back! "Back from WHERE" you say? Was she ever gone? My daughter's blog "Adventures of Veggie Barbie and Carnivore Ken" is back up and running after some computer difficulties, a lost camera and lots of homework getting in the way. Barbie (and Ken) have lots of new veggie adventures planned, never fear. Tune in over there when you're bored with my blog. She'd love it. Oh yay! I always loved reading about Barbie's adventures. I even showed my mom the cute blog :o).